NFOG Meeting 2019 - Do the right thing! The registration is now closed. Please contact support@meetagain.se if you have any questions. Welcome to register for NFOG Course "Do the right thing! - Everyday dilemmas in obstetrics and gynecology and how to deal with them"
To start the registration process, please select your registration type below. 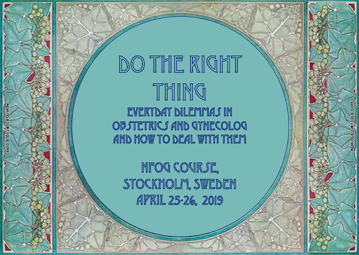 If you are a member of NFOG or one of the Nordic National Societies of Obstetrics and Gynecology (DSOG, SFOG, NFG, SGY, FÍFK), choose registration type "Member". If you are not a member, choose registration type "Non-member". Early Bird (until 15 March): SEK 2 000. Late Fee (from 16 March): SEK 2 300. Early Bird (until 15 March): SEK 3 000. Late Fee (from 16 March): SEK 3 300. Conference dinner is included in the fee for both members and non-members but you will have to indicate if you are planning to attend.